16/04/2019: Lovely but hidden down a very quiet side street! Food was excellent. Less than 5 min walk from beach front. 07/04/2019: Freshly cooked and tasty Vietnamese food. Handy for the Hippodrome Circus. Very friendly service with a special welcome for children. Our 9 year old grandson loves the chilli beef and egg noodles, as do we. The pork and fish dishes are equally enjoyable. For drivers, and children, we can recommend the fresh lemonade with orange. 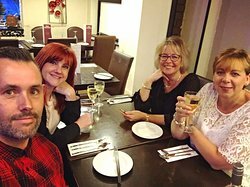 30/03/2019: Had another really lovely meal at Saigon with friends and family, food wonderfully fresh and tasty. Always would recommend the Salt & Chilli Aubergine. All of us really enjoyed the food, and were very well looked after! 02/02/2019: We recently visited Saigon with some friends for the first time in ages. The food was very good and the all you can eat buffet menu was great value. Mixed hors d'oevre starters, plenty of duck pancakes, and great selection of mains. My favourites were the prawns in a really light batter and sweet and sour chicken, but everything was good and they were very amenable to the gluten free dietary requirements of two of our party. 11/10/2018: Good food and friendly service. Offered us free drinks on house as it was my daughters graduation. Recommended. 05/04/2019: Had a house special chowmein and sorry to say it was disgusting. Beef was so fatty and smiley, pork was dry and the bed of chow mein was full of grease. Never eat there again. 04/04/2019: Have reviewed this place before with glowing compliments but last nights meal was beyond awful.i hear there has been a passing of the torch(as such) here which has in my opinion ruined the take away.after last nights £30+ meal I feel I need to raise my voice.burnt sweet n sour chicken balls.prawn crackers that were beyond edible. Greasy pancake rolls.bland chow main and the chop suey,well I tasted q onion piece and threw it all in the bin..i wouldn't feed that to a dog...worst meal I've ever ate.will never return to the new style place...never have I had to take s drink to wash the taste outta my mouth after a meal like I did last night. 13/01/2019: Had a lovely family meal here with the all you can eat buffet. The food was fresh and maintained with refills often. There was a nice selection of food and a good choice of desserts. The staff are very friendly. It was quiet and we were seated quickly. 13/08/2018: I used Just Eat service for take away which was brilliant. However, I didn’t get the dishes I ordered. I ordered grilled king prawns and got fried prawns in a thick sauce; I also ordered fried chicken with green peppers and got chicken and black bean sauce. Very weird. After reading some of the reviews I wonder if we got someone else’s food. Yuck!!! 25/10/2017: We arrive at 1pm on a half term weekday, despite our order being taken reasonably promptly it took 40 minutes for our duck and pancakes to arrive. The duck was dry and tasteless, the pancakes were hard and stuck together! Won’t be going back! 20/10/2017: Awful, awful dim sum, passable phor. Not worth going in detail just go elsewhere..................... Two stars for phor, no star for dim sum. 25/01/2019: Sandringham is HM the Queens private house. As it is a very small village there is no Melrose Street. So where is this restaurant? 22/01/2018: Our family group of 6 adults and 3 children often dine here. And this time we just decided on a heap of entrees and one big serve of spicy Snapper. 24/10/2018: Excellent experience and great service, the food was delicious. All the staff were so attentive, we can’t wait to visit again. 18/09/2014: cheap but tasty food, an array of quality kebabs served with rice and stays open fairly late. don't let the decor or the studying all night insomniac lonely computer science Phd students sitting in the corner put you off, this place is a gem.